In 1926, shortly after the Legion Hall opened, the Danville library moved from its location over the Post Office on Front Street to a room in the hall. The new library was in the hall’s northwest corner, where the kitchen is today. Edith Clark was the first librarian. Barbara Parks and Gary Soto remember going into the library for books and looking at a stereopticon with various slides. “A large entertainment given in Danville toward the end of February netted sufficient funds to pay entirely for the filling up of the new Library room in the Legion Building. The room is a joy to the whole community. On March 15 and 16, a force from the county library moved the books…The library was opened the next day without ceremony. The part of the building devoted to the library is delightful, sunny and large enough for a few years…”. For the first decades of these “few years” the space was adequate for the population of around 400. Danville readers enjoyed a quiet atmosphere where they might browse through the book shelves and relax in the wicker chairs. Myrtle Osborn succeeded Mrs. Clark in 1945 and Grace Warren was the next librarian. The Veterans Hall library closed in 1961 when the new San Ramon Valley Library opened. 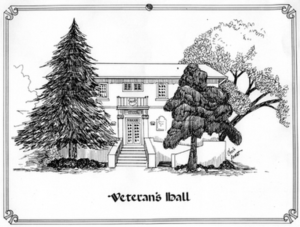 The hall has been used for veterans’ meetings, the Chamber of Commerce office, the Justice of the Peace court, the hilarious Legion Follies from 1946 for about 10 years, plays, parties, recreational classes and events of all sorts. It was the County Supervisor’s office in the late seventies. Saturday night dances were a primary use for the hall. Today many people still remember the monthly “dollar” dances, with Mabel Christianson and her band teaching people how to dance the two-step, mazurka and polka. Romances blossomed at these dances and older couples enjoyed the dancing as well. In 1978, after getting Community Development Block Grants, R-7 funds and other donations, the hall was renovated as the Senior Citizen’s Center. Dave Stegman and the Community Center spearheaded this effort. A complete kitchen, handicapped restrooms, a disabled ramp and upgraded electric and plumbing systems were installed. The Grand Opening brought 500 people to the celebration, including Congressman George Miller. After the Town of Danville was incorporated and took over recreation programming, the hall continued as an important community facility. The improvements of 1978 were just a start. In 1992 estimates for complete renovations ranged as high as $1,500,000. Since the county owned the building in trust for the veterans, it was and is hard for the Town to justify spending that much on a property they do not own. Danville is a town which clearly values its Old Town and historic buildings. The Town has worked to save the Southern Pacific Depot (1891), the Village Theatre (built in 1913 as the Social and Fraternal Hall), the Cohen/Vecki house (1866) and the Town Meeting Hall (1933). The Town also recognizes the value of historic tourism in which visitors look for authentic buildings with special community stories. Pleasanton, which has a vital historic downtown, is spending money to renovate its Veterans Hall. Recently Walnut Creek and Lafayette tore down their historic veterans halls to construct a large community building, but neither of these cities has a historic downtown. 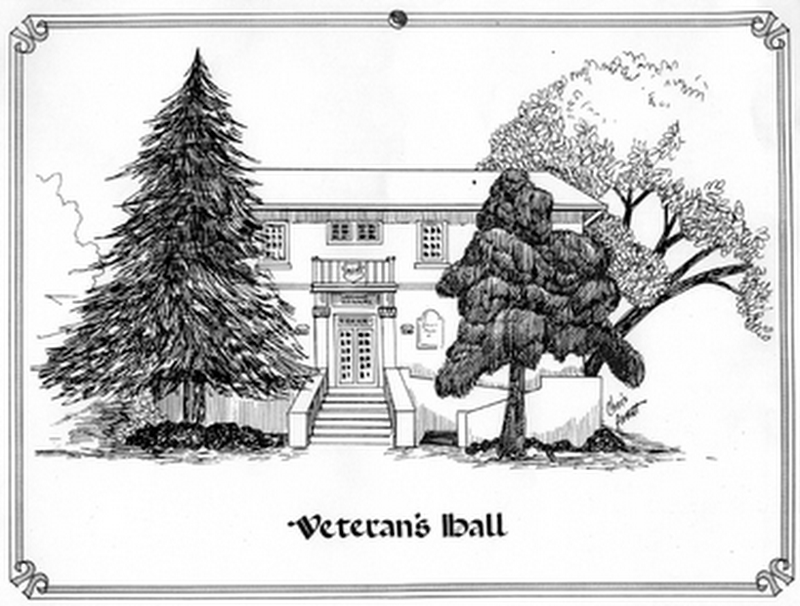 The Memorial Hall in this location is important to San Ramon Valley’s history. Reproductions are not the same. Buildings which have served public purposes are particularly significant to any community’s past. The small commemorative monument and the hall itself, both in the heart of downtown Danville, remind us of sacrifices made for our country. If walls could speak, there would be generations of stories told, from sweethearts who met at the dances, to young readers who discovered Shakespeare, to veterans who share their memories with friends. The Veterans Hall continues to serve the community and serve it well. Sources: News Notes of California Libraries (April 1926), Walnut Kernel (1941), Valley Pioneer (June 7, 1961; March 29, 1978), Tri-Valley Herald (May 5, 1996), Museum of the San Ramon Valley archives.